BEIRUT -- Twin suicide bombings struck a southern Beirut suburb that's a stronghold of the militant Shiite Hezbollah group on Thursday evening, killing at least 43 people and wounding scores more in one of the deadliest attacks in recent years in Lebanon. The attack was quickly claimed by the Islamic State of Iraq and Syria, or ISIS, which is fighting in neighboring Syria and Iraq but has not had a recognized affiliate in Lebanon, though the tiny Mediterranean country has seen deadly spillovers from the civil war next door. The explosions hit minutes apart during rush hour in an area of southern Beirut called Burj al-Barajneh, a Hezbollah stronghold. The Shiite group has been fighting in Syria along with Syrian President Bashar Assad's forces. The area has been hit in the past and Sunni militant groups have threatened to carry out more attacks there. Along with the 43 killed, the bombings also wounded 239 people, the Health Ministry announced. It was not immediately clear how many attackers were involved. According to a Lebanese security official, the first suicide attacker detonated his explosives vest outside a Shiite mosque, while the second blew himself up inside a nearby bakery. An apparent third attacker was found dead, his legs blown off while he still wore an intact explosives belt, said the official, speaking to The Associated Press on condition of anonymity in line with regulations. The official speculated that the third man may have been killed from the explosion set off by the second bomber, as he was reportedly close to that blast. Al-Mayadeen TV also reported there was a third would-be bomber, and showed a video of a bearded young man with an explosives belt. The report said he died before he was able to detonate his explosives. At the scene of the blasts, residents showed reporters what they said were metal pebbles that are usually put inside an explosives belt to inflict maximum casualties. "They targeted civilians, worshippers, unarmed people, women and elderly, they only targeted innocent people," Hezbollah official Bilal Farhat told the AP, calling it a "satanic, terrorist attack." Hospitals in southern Beirut called on people to donate blood and appealed to residents not to gather at hospital gates so that ambulances and emergency staff could work unhindered. For more than an hour, ambulances struggled to ferry the wounded and the dead from the neighborhood while Lebanese troops and Hezbollah gunmen cordoned off the area, preventing anyone from getting close to the site of the two blasts, less than 50 yards apart. "There is a massacre inside and we will not let you take photos," a Hezbollah member screamed at an AP photographer at the scene. Prime Minister Tammam Salam condemned the "cowardly criminal act," urging the Lebanese to unite. U.N. Special Coordinator for Lebanon Sigrid Kaag also denounced the "heinous attack," stressing the need for those responsible to be brought to justice and saying that the international community was standing by Lebanon. ISIS posted its claim of responsibility on social media pages linked to the Sunni militant group. The claim could not be independently verified but it was similar to other ISIS claims. ISIS said the attack was carried out by detonating an explosives-laden motorcycle close to a gathering of Shiites - a likely reference to the mosque - and that it was followed by a suicide bomber wearing an explosives vest. The statement made no mention of a third, would-be bomber. "Let the Shiite apostates know that we will not rest until we take revenge in the name of the Prophet (Muhammad)," the ISIS claim said. 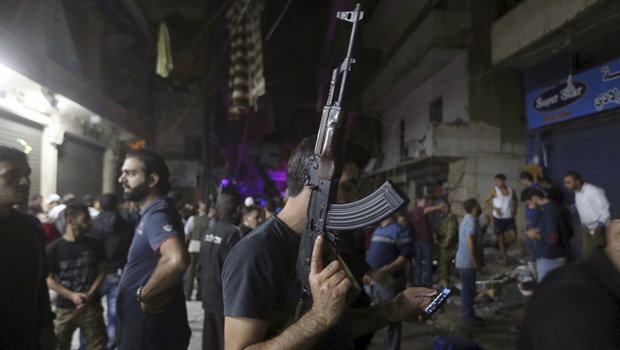 Thursday's attack shattered a period of relative calm in Lebanon. It was the first such large-scale bombing since mid-2014, and comes amid much political upheaval in the country. It was also the deadliest attack in Lebanon since Aug. 23, 2013, when two car bombs exploded outside two Sunni mosques packed with worshippers in the northern city of Tripoli, killing 47 people and wounding hundreds. Lebanon has been without president for over a year. The country has seen major protests in the past few months over the government's inability to agree on a solution for a festering garbage crisis, and parliament has not functioned properly for years. A spate of similar bombings in 2013 and 2014 targeted Hezbollah strongholds in retaliation for the group's involvement in the Syrian civil war, which has angered Sunni groups across the Middle East. As for ISIS, this is the second attack it's claimed so far in Beirut, after a January 2014 bombing in the district of Haret Hreik, also a Shiite neighborhood in the Lebanese capital, according to the U.S.-based SITE Intelligence Group, which tracks militant messaging on the Internet. Syria's civil war has spilled over into Lebanon on multiple occasions, inflaming sectarian tensions between the country's Sunnis and Shiites and leaving scores dead. The Lebanese Sunni and Shiite communities have lined up on opposing side of Syria's civil war - Sunnis broadly support the Sunni rebels fighting against Assad while the Shiites typically back Assad. Lebanon also hosts more than 1.1 million Syrian refugees - equivalent to a quarter of the country's entire population.